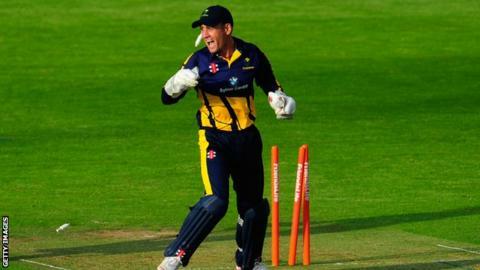 Glamorgan coach Toby Radford hopes his side can build on their Twenty20 win against Hampshire in Southampton on Friday. Will Owen took 3-32 as Glamorgan restricted Hampshire to 151-6 to secure a 10-run T20 Blast victory. Radford says the county's first ever T20 win at the Ageas Bowl is "massive" for confidence in the dressing room. "The boys are thrilled to get the competition off to such a great start," he said. We said we wanted a lot of passion and commitment and I thought we showed that tonight. We want to get on a roll now. Glamorgan were put into bat first and led by Jacques Rudolph (34) and Mark Wallace (33) they set Hampshire a target of 162 to win. In reply, Hampshire struggled to match the required run-rate but rallied after James Vince fell for 38 through Sean Ervine (27) and Matt Coles (42). But after Owen bowled Ervine to make it 130-4, Hampshire limped to defeat. Jim Allenby also gave Hampshire a tough time, conceding just 19 runs from his four overs. Radford was pleased with his side's performance and hopes they can gather momentum in the competition. "I always like to get runs on the board and put people under pressure," said Radford, "and it looked a good wicket and we know we've got a lot of top order batters there, that can do a good job. "It was a good score. I think we were just about 100 off 10 overs. We were really flying, sort of 10 an over. "We lost our way a little bit. Lost two wickets back to back in the 12th and 13th over and then clearly after that bowled very well to restrict them. "I think the other big thing tonight was the speed in the field. Everyone dived in. "We said we wanted a lot of passion and commitment and I thought we showed that tonight. "We want to get on a roll now." Glamorgan's next match in the T20 Blast is against Essex in Chelmsford on 23 May.